Tour Guide/ Tour Manager is an exciting and rewarding career providing opportunity to work and travel at the same time. Meeting, and working with people from diverse backgrounds, and with different personalities is interesting, challenging, and as such, enables one to grow, and develop professionally, and personally. 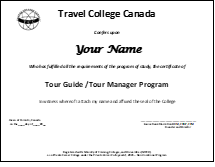 Successful Tour Guides have pleasant, outgoing personality with ability to manage groups with maturity, and respect. Positive healthy attitude toward self, and others is essential, and highly valued. On average, allow about 80 hours to complete studies, research, Assignment, and Test. It is recommended the student dedicate 8 or more hours per week to finish within 10 weeks (3 months). If more time is needed, the student may email our office to request program extension. This is a non-vocational program, so it is open to anyone with interest in learning, and developing skills and knowledge for this profession. As a Distance Education program, the student can live anywhere in the world. C$375.00 includes Theory Notes, Assignment, Test, and Certificate upon successful completion (average grading of 70% or higher.) for online email pdf format. For those preferring hard copy (binder) format, please add C$35.00 for mailing costs to the program fee of C$375.00 for a total of C$410.00. The student is encouraged to start their program immediately materials are received. During the program, we welcome emails, or calls with any questions or when assistance is required. We endeavour to respond within 48 business hours. Upon successful completion of the program, and when a pass grade average of 70% or higher is achieved, a certificate is issued within thirty days.